It's not common for me to fall in love with book boys. There are many that I like a lot, but the only two book boys that I fell in love with were Peeta Mellark of The Hunger Games and Jace Herondale of The Mortal Instruments. 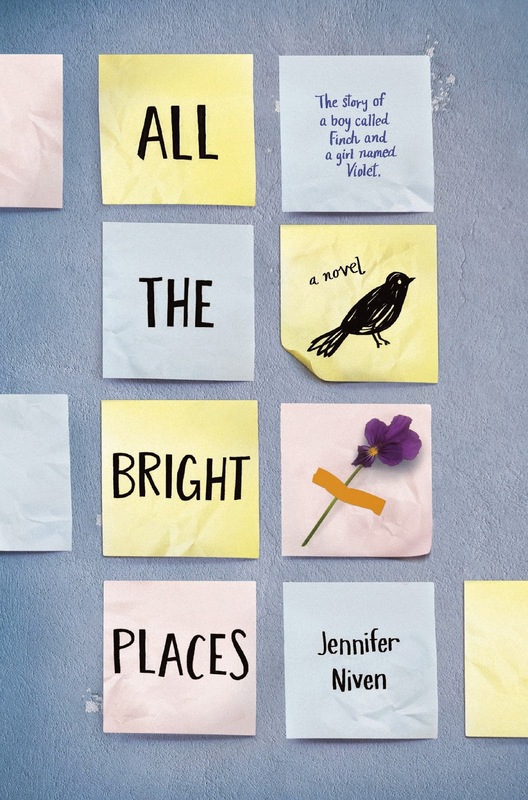 However, after reading All The Bright Places I am officially adding Theodore Finch to the list. Theodore Finch, more commonly referred to as "Finch" is a freak. He's weird, always changing his personal style and attitudes, gets into fights, goes missing for long periods of time, and some times speaks in different accents. Violet Markey is popular, beautiful, and a talented writer with a blog that even famous celebrities read. But all those things don't matter to her at all after the recent death of her sister. Violet and Finch walk two different paths that generally wouldn't cross, until one day they find each other on the ledge of the school bell tower, and it's not clear who saved who. I mean, IF they were going to jump. What starts off as a story of unlikely friends, becomes something compelling, passionate, thought provoking and heart wrenching very quickly. I don't rank books on a star system on this blog, but if I did, this would be the first five star I would have given in a long while. There are a lot of things that make this book, but the character building is brilliant. Brilliant and complex and thorough. That's probably why I fell in love with Finch. I fell so hard for Finch. Finch and Violet alternate chapters, telling the story from their point of view. They have deep thoughts, they both come from places of hurt and regret, they both feel and then don't feel so much. I could not stop turning pages, even though I was exhausted and it was past midnight. (which is a big deal for this mama.) Some people have compared this story to The Fault In Our Stars. I loved that book a lot, but I'm going to venture out there and say that this one is even better. The character growth is done well too. And when they each take their own, whether to themselves, their families, or their peers, it always felt powerful. This book addresses some serious and strong issues, namely suicide, depression, and bullying. Because of that, it will make you think and make you cry in a way that you will remember. I decided that Kombucha would be a good drink for this book because of it's alleged healing properties. This book is full of people looking for different types of healing. Kombucha is said to enhance mental clarity, promote longevity, cure all diseases, provide energy, etc. Who knows if it really can do all of that. I've never had any. But the people in this book could do with help with those things, and I'm pretty sure we all can too.